This is a great skill game that takes place in older times when people used to duel for supremacy. You have a horse and a lance and you want to show the king that you can win his special prize called The Lance. The winner will take all so you have to be prepared for a fierce battle. 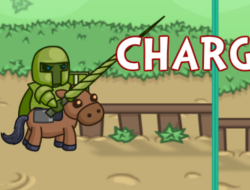 Do your best to spam the click to get your horse up to speed and then when you are near the opponent aim for the least protected area with your lance. Duel with them until they all fall off the horses and make sure to upgrade your armor to become more efficient on the duel area. The Lance 0.00 between 0 and 10 based on 0 votes.